What are ‘smores’ do I hear you ask? Well, according to Wiki a ‘smore’ is a “traditional night-time campfire treat popular in the United States and Canada”. 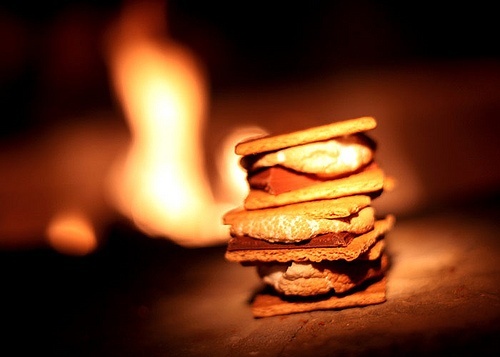 Smores are traditionally made by sandwiching a roasted marshmallow and a layer of chocolate between two pieces of graham cracker. To translate that, it’s a roasted marshmallow and a thin slab of chocolate sandwiched between two digestive biscuits. The name is apparently a contraction of the phrase ‘some more’. There’s a recipe for how to make smores here – don’t forget you can substitute digestive biscuits for the graham crackers (if you don’t have any chocolate, why not use chocolate digestives with the chocolate face turned inwards?). Here in the UK, the most popular of outdoor campfire treats is the good old baked potato. If you want to try adding a twist to your baked potatoes, why not stuff them? While the potatoes are wrapped in aluminium foil cooking away in the embers, dice a small onion and a small red pepper. Chuck those into a mixing bowl and then grate in a load of cheese (Cheddar works really well, but whatever cheese you fancy). Pull out the baked spuds when they’re ready, cut each one in half and scoop out the potato flesh (using a spoon) into the mixing bowl. When you’ve scooped out all of the potatoes (reserving the two halves of the skin, of course), grab your potato masher and mash all the ingredients together, adding some herbs, salt and pepper to taste. Then using a spoon, refill the potato skins with the mix, sandwich back together, cover in foil and toss back into the embers to reheat. If you don’t want to put them back into the campfire, lay all the filled potato halves on a tray and brown under the grill. This works just as well for potatoes baked in the oven (make sure you crisp the skins while cooking by oiling slightly for a real crunch that will get everybody eating the skins). Another favourite campfire dish of mine is baked apples. We’ve probably all had baked apples done in the oven, it’s been a popular pudding in the UK forever. However, baked apples are just as scrummy done in a campfire as long as you keep them well away from the flames – try propping them on a barbecue grill just above the embers. First of all you need to remove the core from your apple (cookers are great, but any apple will do – Granny Smith’s are particularly tasty) without actually cutting right through to the base if possible. Don’t worry if you do cut through, it will just make your apple a bit stickier when eating. Stuff the core with layers of sultanas and desiccated coconut and add a dollop of golden syrup. Wrap in aluminium foil and then cook above the campfire embers for 40 minutes or more. Place the whole thing (foil and all) into a bowl, then unwrap and eat with a spoon. If you want a variation, try stuffing with walnuts and raisins.